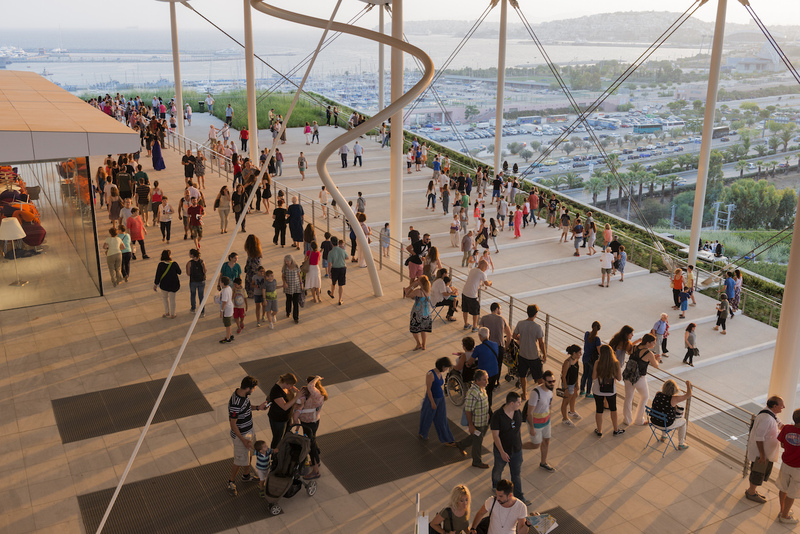 Victoria Newhouse’s new book about the Stavros Niarchos Foundation Cultural Center in Athens positions it as an architectural symbol. 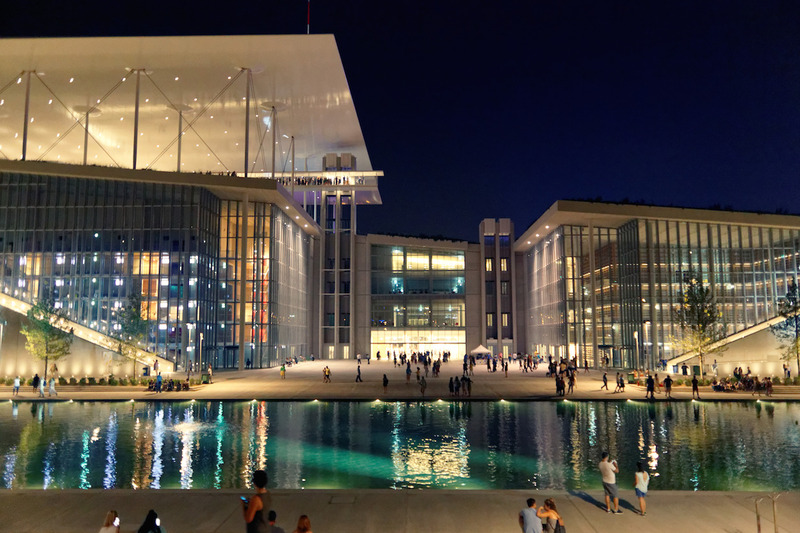 Of all the institutional buildings to be completed in the past year, the Stavros Niarchos Foundation Cultural Center in Athens, designed by Renzo Piano Building Workshop (RPBW), may offer the most fascinating, complex, and layered tale. 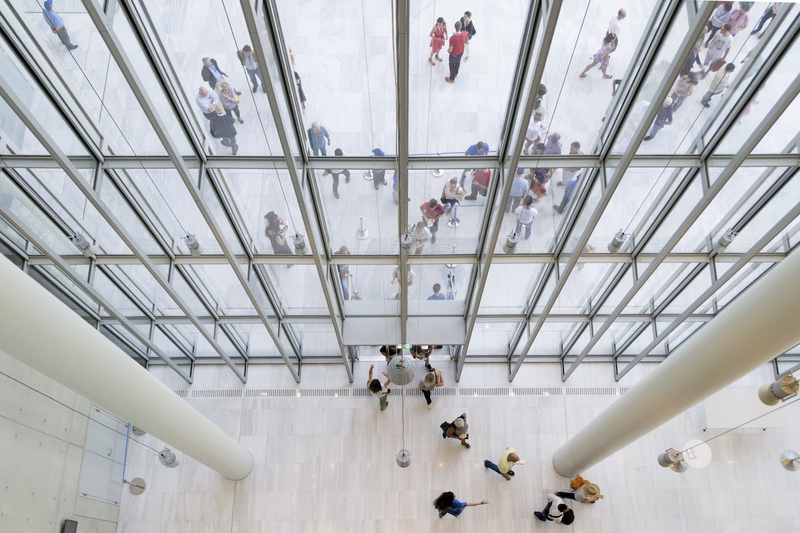 With Chaos and Culture (The Monacelli Press), which comes out today, architectural historian Victoria Newhouse has taken a headfirst dive into the 535,000-square-foot facility. It’s rare that a book on a single building can sustain itself, but here Newhouse’s does so mightily. Weaving together the cultural center’s many conflicts and contractions—as well as the victories; it is, after all, a beautiful, poetic structure—Chaos and Culture is the kind of architecture book the world needs more of: well researched, culturally astute, and historically sensitive. Here, Surface speaks with Newhouse about the undertaking. When and how did this book start to take shape? When I was finishing up my work on my last book before this one, Site and Sound, which was about new opera houses and concert halls. In researching and writing that book, I came to realize how incredibly difficult it is—how complicated it is—to design venues for classical music. I think that that kind of building is much more challenging than a museum because of all the issues of acoustics and circulation and so on and so forth. With that realization, I started thinking about different projects started by cultural institutions and realizing, or certainly suspecting pretty strongly, that the boards of trustees of these institutions—who make these decisions, too—leap into these projects with very little knowledge of what’s involved. This book is really about the whole process and what the client is going to be faced with if they decide to take on this kind of project. What makes this particular building a compelling book subject? Well, first of all, the political and economic situation in Greece. Because the government had approached the foundation before the 2008 world financial crisis hit, and the foundation had agreed, informally, to go ahead with this enormous project—which ended up costing almost a billion dollars—before any of those problems had surfaced. When the problems did surface, almost a year later, the foundation could well have backed out. They could have said, “Well, this is an impossibility. It’s going to be too difficult, the government is never going to be able to maintain this place,” and many, many other considerations. But they didn’t. They stuck to their guns and went ahead with it. I would say that that was the major hurdle, and, in fact, it remains a hurdle today, because the formal agreement calls for the government taking over the management of the facility and paying for that management, as well as for the maintenance of the facility, when it was handed over to the government upon its completion. From a design perspective, what do you think makes this building so special? One thing is the challenge of the site, which is very heavily prone to earthquakes. Before they could even start to think about designing the building, they had to take measures to reinforce the terrain, which I have a whole chapter on—it’s really fascinating what they had to do. And then there were cultural differences. 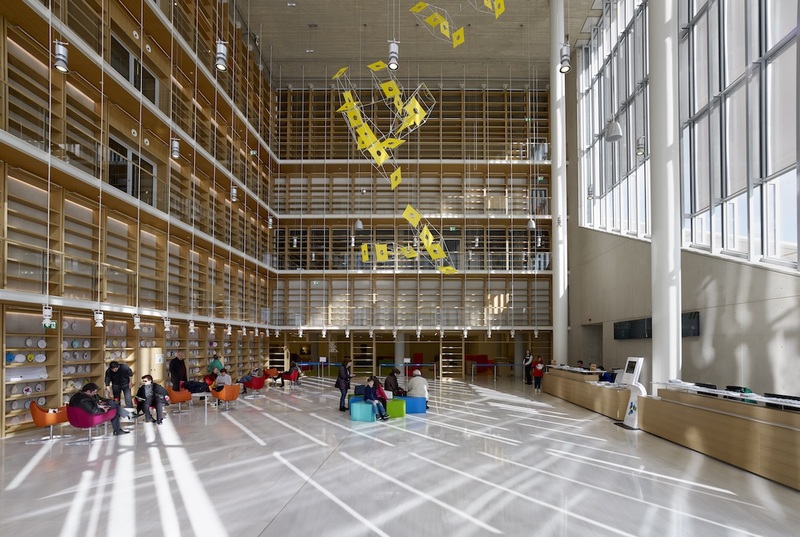 The project is for the National Library of Greece, which had totally outgrown its early-20th-century building and is now working out of three buildings and an opera house. And one of the most amazing facts was that there was no catalogue of the library, so they really had no idea what was in it. Again, it’s a profound problem with the government, because it’s a government-owned facility. The government has been very remiss about dealing with all of it’s cultural facilities. Not only was there a question about what exactly was in the library, but the architects didn’t have a client to work with, somebody who was going to be a continuing presence at the library. What was the timeline of writing the book? Were you putting it together throughout the construction period? Yes, and if you look at the acknowledgements, you’ll see the dozens of people that I talked to. Many said that there were more specialists involved in constructing this building than any other project they had ever seen. Apart from the structural engineers, who dealt with the problems of possible seismic damage, which affected not only the terrain but also the building itself, which is kind of on roller-skates—it’s an amazing system to protect it from earthquakes. One of the great innovations of the building is this canopy that covers the whole opera house. It’s not on the opera-house roof; it’s raised about 30 feet above it, and it’s made out of a material that really hasn’t been used in the West since the 1950s, because it’s just so labor-intensive. It’s just much too expensive to use in the West, where salaries are higher than they are in Greece. The material that was used is called ferro-cement, and it involves virtually knitting together the wire mesh that’s part of the construction of it. The mesh is a fairly high-tech element because it’s a support for solar panels—it was actually fabricated by workers on their hands and knees, knitting it together by hand. You mentioned the building’s site earlier. Can you elaborate on the park itself? Specifically, tell me about the landscape, which was done in partnership between RPBW and Deborah Nevins & Associates. Well, Renzo had worked with Debbie Nevins on a private home in Aspen for the Pritzkers—who originated the famous architecture prize—and Debbie had done the landscaping on it. He had a very good relationship with her after that, and so he invited her to do the landscaping here. What Renzo discovered very early on when he started to work on this was that although it’s only really a few hundred feet from the beautiful Faliro Bay, it had no view of it. And very little view of anything else. So he decided to build an artificial hill, a hundred feet high, in which to place the building, and to cover that hill with a park that was designed by Debbie Nevins. It achieved its purpose of providing views in both directions—both to the south of the bay and to the north of the Acropolis. In the writing of the book, what was your connection to Piano himself? What role did he play in shaping the book? Did you get to spend a lot of time with him? Renzo was very welcoming and supportive from the beginning. He’s an old friend—we’ve known each other for more than 30 years. And he really did everything to facilitate the book. Whenever he came to Athens and his visits coincided with my own visits, because I was going twice a year, he invited me to go around the site with him. Renzo in Athens was a real celebrity. Everybody working on the site would follow him around with their cellphone cameras, clicking away to capture his various activities. The one problem was getting Renzo for a couple of hours to talk in-depth about the project, and he never had time when he came to Athens, because he was on-site almost 12 hours a day and much too busy to allocate that kind of time to an interview. Finally, I arranged to fly to Paris, just to interview him, and he put aside two afternoons for me. It was during those many hours of talks that I got most of his personal statements about the project. What were some of the anecdotes or elucidations? Renzo is more of an idealist and a romantic than I had imagined. His whole philosophy of the redemptive power of beauty, which he applied very much to this project, was something that I was unfamiliar with. He talked about how one of the first reconstructions in Milan after the Second World War was the La Scala Opera House—how instead of going immediately to residential or whatever, the priority was to rebuild this icon of Italian art. He felt that the Niarchos Foundation fit in with that philosophy. He became very close friends with Andreas Dracopoulos, the director of the foundation, and they shared this idealistic idea—that this very beautiful cultural facility could be a kind of symbol of hope to the country. I find it interesting how well you documented the building within the historical context of architecture. What was your approach to incorporating architectural and design history into the book? The history of Greece is incredibly complex, starting with the fact that for 400 years it was part of the Ottoman Empire, and during that time, the Greek population that was incorporated was penalized, in that they were made to pay higher taxes than the Muslim population. There was a tremendous resentment about that, and I think that’s one of the many things that have been left over from that Turkish occupation. When I started to learn about the history of Greece—because, frankly, I knew nothing about it when I started this project—I learned that Greece only became an independent country at the outset of the 19th century. And even then, from those beginnings, it was totally dependent on loans from European countries, among them France and Great Britain. So what’s happening in Greece today has roots that go back a long, long way. It’s the same, actually, with the city of Athens. 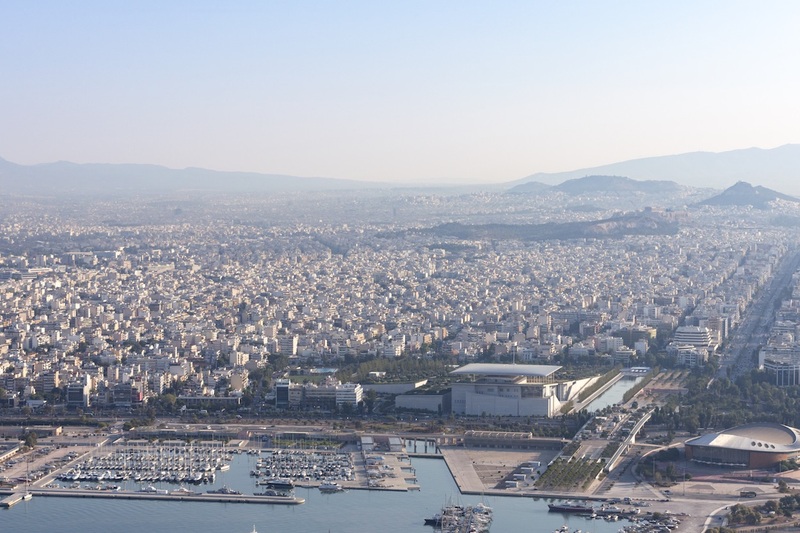 When you study the urban history of Athens, the Greeks are extraordinarily intelligent people and have had some wonderful architects and designers in the course of their history—and there were constantly plans to improve Athens, which never got built. So many projects for the city never see the light of day because of an incredibly inhibiting bureaucracy, which is, again, a leftover from the Ottoman occupation. In Athens, there are ten people doing a job that we here in the United States or in a European country would have maybe one person doing. I felt to understand what’s going on today, I had to give that historical context. How did you decide which architectural references made sense to include? Mostly I was looking at other projects by Renzo. I was trying to give the reader an idea of the scope of his work, from some of the music facilities he has built, like the three concert halls in Rome; to the airport in Japan, which is humongous; to the tiny, jewel-like Pathé Foundation in Paris. What do you think the Niarchos Foundation building represents in this current moment for Greece? I think it’s a tremendous symbol of hope, and in the numerous times that I went to Athens, I never heard anybody criticize it. I never heard anybody say, “Oh, they should have spent the money on humanitarian aid.” On the contrary. There’s tremendous pride in the fact that Stavros Niarchos was one of the most successful men in the history of the country. I understand that, although it hasn’t opened officially, they are having trial runs at the opera, and they’re always sold out. The tickets are extraordinarily inexpensive—I think the most expensive ticket is something like thirty euros. People there really see it as the light at the end of the tunnel, a symbol of what they hope to achieve.